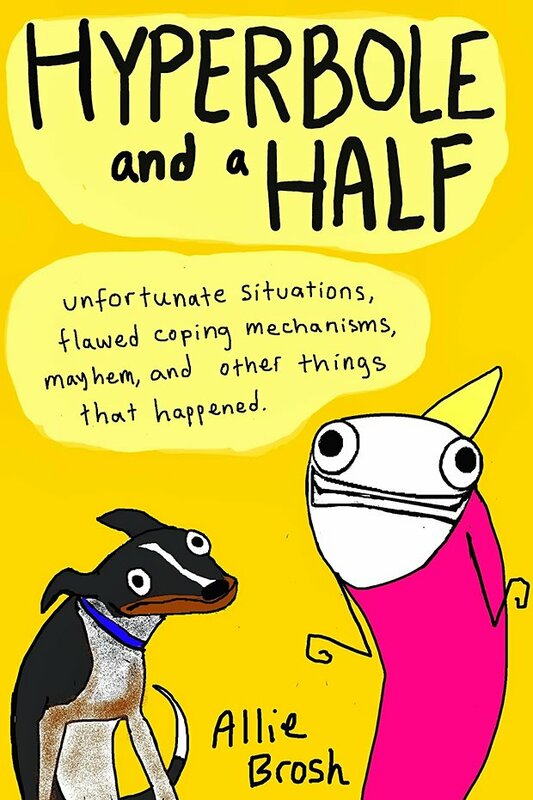 The second that I stumbled across a blog entry that Allie Brosh posted about her “simple dog” getting lost outside, I realized that we’d totally be best friends if we lived in the same town. I’m sure about a billion people felt the same way, since her website Hyperbole And A Half is pretty darn popular. So popular that Allie was offered a book deal, which had an insane amount of pre-orders months before it was released. But alas! Her book was finally released this October after many months of waiting, and fans of her MSPaint drawings and witty commentary about her life/life in general were quite pleased. Personally, I read it in less than a day. Within that day, I shared passages with my Dad. “Why does that girl look like a fish?” my Dad said, while finally learning how a Kindle worked. Honestly, fish drawings aside, I could tell he dug the humor. In fact, he mentioned it in conversation the next day, and a week later said something like “Remember that fish girl thing you showed me? It was mentioned in (insert magazine title my Dad reads and swears by)!” That notoriety meant he officially approved. Allie recently gained a lot of internet fame by showcasing her depression in a way that everyone could relate to – especially to people who, luckily, never had to deal with it before. As someone who has faced the mental demon in the past, I know that her representation is, quite possibly, the best way to explain what an individual truly feels like when their brain decides to malfunction and focus only on the negative. These passages are repeated in her book, which I think is massively important to those who are new to her craft. She also fills the book with a bunch of new material which you can’t find on the blog itself. Allie has a unique voice, and at less than 10 bucks on Kindle (and less than $20 if you buy the hardcover) her book won’t disappoint you. Seriously, guys – this girl is funny.